The USS ASPRO (SSN-648), a Sturgeon-class attack submarine, was commissioned on 20 FEB 1969. USS ASPRO served her country for 26 years, 1 month and 11 days, until decommissioned on 31 MAR 1995. The second Aspro (SSN-648) was laid down on 23 Noveber 1964 at Pascagoula, Miss., by the Ingalls Shipbuilding Co.; launched on 29 November 1967: sponsored by Mrs. Robert H. B. Baldwin; and commissioned on 20 February 1969, Comdr. Roy R. Wight in command. The nuclear attack submarine sailed on 26 February to Key West, Fla., to load torpedoes. She then headed to her home port, Pearl Harbor. Aspro transited the Panama Canal on 8 March; arrived at Oahu on 24 March; and joined the Pacific Fleet as a member of Submarine Squadron 1, Submarine Division 12. Following three weeks of upkeep, the ship proceeded to Bangor, Wash., where she unloaded her torpedoes before entering the Puget Sound Naval Shipyard on 23 April for alignment of her fire control system. Leaving drydock on 4 May, she held tests along the west coast for one month before returning to Pearl Harbor on 8 June. Local operations occupied her time during the month of July. In August, she served as a school ship for prospective commanding officers and took part in two exercises-"Kilo 5-69" and "Holdex 4-69"-carried out in the Hawaiian operating area. Weapons tests and a reactor safety examination preceded her entry into the Pearl Harbor Naval Shipyard that fall for post-shakedown repairs. The warship got underway again on 6 March 1970 to conduct sea trials around Hawaii, followed by weapons trials during April. From 18 May through 12 June, upkeep at the Submarine Base, Pearl Harbor, occupied her time. Aspro then began to prepare for a deployment. On 19 July, she departed Pearl Harbor for a six-month western Pacific (WestPac) deployment. She arrived in Yokosuka, Japan, on 10 September and commenced upkeep. On 29 September, the submarine visited Okinawa and, the next day, began more than a month of 7th Fleet operations. She returned to Okinawa on 8 November and shifted to Subic Bay in the Philippines a week later for a fortnight's upkeep. She sailed to Hong Kong late in November, providing services to aircraft along the way, and arrived at that British crown colony on 1 December for a week of leave and liberty. After an antisubmarine warfare (ASW) exercise between 8 and 17 December, the warship operated on "Yankee Station" in the Gulf of Tonkin before returning to Subic Bay on New Year's Eve, 1970. The submarine left the Philippines on 2 January 1971, bound for Guam where she spent several weeks engaged in tests before returning to Pearl Harbor on 5 February. She spent the remainder of 1971 alternating periods in port with exercises in the local operating area. On 5 January 1972, the warship commenced a restricted availability at the Pearl Harbor Naval Shipyard which was followed by another month in upkeep. On 11 March, she resumed operations in Hawaiian waters and, on 15 April, began preparations to deploy. Aspro finally got underway on 13 May and arrived at Yokosuka on 24 June. After a week in port, the submarine left there on 4 July to begin 7th Fleet operations. She arrived at Pusan, Korea, on 13 August for a two-day visit and then shifted to Sasebo, Japan, for three days. Following an exercise with Hawkbill (SSN-666) from 18 to 26 August, Aspro arrived at Hong Kong on 27 August. On 2 September, she was underway for Guam, where she arrived on 7 September and began two weeks of upkeep. On the 21st, she put to sea to return to Pearl Harbor, arriving there on 18 November. She remained in port through the Christmas holidays. The submarine spent the first three months of 1973 operating locally conducting tests. She left Pearl Harbor on 17 March, bound for Pascagoula, Miss. 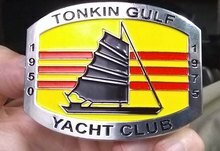 ; transited the Panama Canal on 28 'March; and commenced her overhaul at the Ingalls Shipbuilding Corp. yards in Pascagoula on 1 April. The yard work ended on 12 May 1974, and Aspro departed Pascagoula the next day. After retransiting the canal, she made liberty stops at San Diego, Calif., and Bremerton, Wash., then held acoustic trials in Puget Sound from 4 to 7 June. 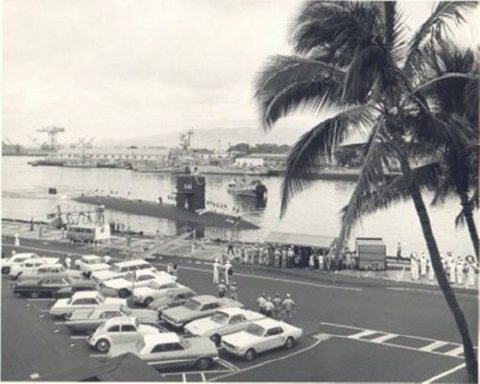 The nuclear submarine returned to Pearl Harbor on the 19th after an absence of more than 15 months and spent the rest of 1974 conducting operations in the Hawaiian Islands. The beginning of 1975 found Aspro preparing for a deployment to the Far East. After her final loadout, she left Pearl Harbor on29 May, conducted an exercise with Rathburne (DE-1057) the next day, and reached Yokosuka on 10 June for a week's visit. On the 19th, Aspro began operations at sea that lasted until 10 August when she arrived at Guam. The submarine participated in exercises with units of the 7th Fleet from 24 August to 3 September, made voyage repairs at Subic Bay from 4 to 16 September, and carried out exercises near Subic Bay with Kitty Hawk (CVA-63) between 17 and 29 September. Aspro left the Philippines on 1 October, bound for the Marianas. She arrived at Guam on 5 October and remained there until 27 October when she sailed for Hong Kong. From 6 to 18 November, the submarine took part in ASW exercises with 7th Fleet air and surface units. After pausing briefly at Guam, she returned to Pearl Harbor on 4 December and commenced post-deployment standdown. The first two and one-half months of 1976 were spent on upkeep and exercises. On 15 March, Aspro entered drydock at the Pearl Harbor Naval Shipyard. Upon completion of this work on 23 April, she began sea trials, exercises, and final preparations for a tour of duty along the west coast of North America. Aspro left Pearl Harbor on 6 September and stopped at Esquimalt, British Columbia, on 16 September for a two-day liberty call. She arrived at Bangor, Wash., on 23 September to unload her weapons. She commenced her overhaul on 11 October 1977. Aspro finished the overhaul on 11 March 1979 and got underway for sea and acoustic trials. On 28 April, she went to Bangor, Wash., for weapons trials. The nuclear submarine made the voyage to San Diego between 17 and 22 May, conducting deep water acoustic trials en route. Upon her arrival in San Diego, she spent one week in availability with San Onofre (ARD-30). Aspro arrived back in Pearl Harbor on 8 June after an absence of 21 months and spent the remainder of 1979 conducting training exercises, ASW operations, and preparing for a deployment in 1980. Those preparations continued through January 1980 and well into February. The nuclear submarine embarked upon her voyage west on 24 February and arrived in Buckner Bay, Okinawa, on 9 March. On the llth, Aspro put to sea to take part in Exercise "SHAREM 35." She returned briefly to Buckner Bay on the 16th then set out for the Philippines. The warship entered Subic Bay on 20 March and remained there until 6 April. At that time, she got underway for the Mariana Islands. Aspro stayed at Guam �om the 12th to the 24th and then set sail for Japan. The nuclear submarine made a brief stop at Yokosuka on 4 May before embarking upon a month of operations at sea. Aspro returned to Yokosuka on 10 June but put to sea again on the 12th on her way to Hong Kong. The liberty call at Hong Kong lasted from the 17th to the 21st, and then Aspro headed back to Guam, where she spent the period from 27 June to 16 July. She put to sea on 16 July for her last operational assignment of the deployment. She concluded both that operation and the deployment at Pearl Harbor on 30 August. Following the usual standdown period, Aspro resumed local operations in the Hawaiian Islands. She remained so employed until the beginning of 1981 when she began a restricted availability at the Pearl Harbor Naval Shipyard that lasted until late in March. On 26 March, the nuclear submarine left the shipyard and resumed normal operations out of Pearl Harbor. That duty occupied the warship's time until midsummer when she began getting ready for another tour of duty in the Far East. Aspro stood out of Pearl Harbor for the Orient on 2 September. During the deployment, the warship visited a variety of ports in the western Pacific and in the Indian Ocean and successfully prosecuted all her operational missions. The nuclear submarine returned to Pearl Harbor on 16 March 1982 and commenced the normal month of post-deployment leave and upkeep. Aspro resumed operations out of Pearl Harbor in April 1982. She participated in the multinational exercise, Operation "RIMPAC 82" and served as a training platform for both prospective commanding officers and midshipmen. Early in July, the nuclear submarine embarked upon a five-week cruise that took her to the California coast and back. During that mission, she participated in ASW exercises and in FLEETEX 1-82. Aspro arrived back at Oahu on 12 August and began preparations for cold weather drills. On 15 October, Aspro and Tautog (SSN-639) got underway for the Arctic region. In addition to their cold weather drills, the two nuclear submarines gathered scientific data to improve our knowledge of the cold northern region. They also made a winter rendezvous at the North Pole on 20 November 1982 celebrated by the mailing of cachet envelopes preparedspecially for the occasion. Aspro returned to Pearl Harbor on 15 December and commenced holiday routine. The relative inactivity of the holidays blended almost imperceptibly with the upkeep at Pearl Harbor that occupied the nuclear submarine during the month of January 1983. In February, she resumed duty in the Hawaiian operating area, and those evolutions continued through March, April, and May. In June, Aspro began preparations for another tour of duty with the 7th Fleet. The warship departed Pearl Harbor in July for a deployment highlighted by visits to many of the exotic ports of the Far East and successful completion of all assigned missions. She returned to Pearl Harbor on 23 October and, after post-deployment standdown, took up local operations. That duty continued into 1984. On 16 January 1984, however, the nuclear submarine entered the floating drydock Competent (AFDM-6) for a restricted availability. Later, she resumed operations at sea. On 24 July 1984, the nuclear submarine deployed to the western Pacific once again. Operating both in the Pacific and Indian Oceans, Aspro carried her assignments to successful conclusions and made port calls at a number of interesting places. She returned to Pearl Harbor in January 1985 and, following the usual leave and upkeep period, embarked upon local operations once more. In April 1985, she visited the west coast again. That summer, Aspro voyaged to Arctic regions for more cold weather drills. She returned to Hawaii at the end of September and resumed local operations in October. That employment occupied her time through the end of 1985 and for the first four months of1986. In May of 1986, she headed north for another round of cold weather exercises. The warship returned to Pearl Harbor on 11July and remained in the area until early September when she cruised to the northern Pacific. Aspro concluded that voyage on 27 October at the Mare Island Naval Shipyard where she began a regular overhaul on 15 November 1986. At the beginning of1987, the nuclear submarine was still at Mare Island for an extended period of repairs.